"Becoming 'Listing Rich' is within your grasp but there are a few compromises that are required. You must learn to face the world on your own as there are too many destructive influences within a sales-only environment. For the majority of your time your focus will need to be on listings. While this method will be in opposition to that used by many of your associates, it is absolutely necessary. No matter how many times you are distracted from your listing activity you must get back to the daily ritual of speaking to people as quickly as possible." - Charles Tarbey, Listing Rich, 1994. 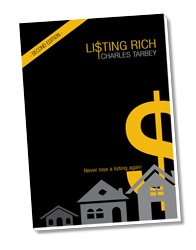 Originally published in 1994, 'Listing Rich' documents Charles Tarbey's key thoughts on how real estate agents can grow their listing portfolios and transfer listings into sales. This book is a timeless and quintessential read for any real estate agent looking to maximise their profitability and take their career to the next level.